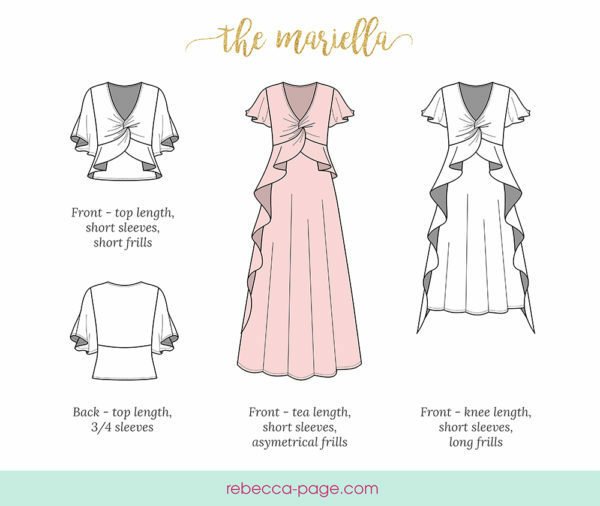 Mariella the Magnificent; an easy to sew (and even easier to wear) ladies knit dress sewing pattern with features to make you swoon! What makes Mariella so magnificent? 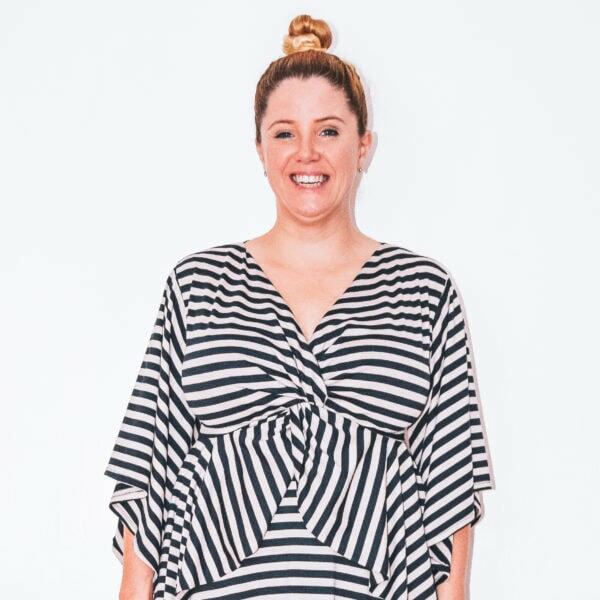 Options – 2 sleeve lengths (short or ¾ length), optional elasticated front for nursing access, 3 lengths (top, knee and, ¾) and 3 frill options (long, short, or asymmetric). Fabrics – Suitable for stretch knits and jersey fabrics, though best results will be achieved with light- to medium-weight knits with at least a 40% stretch. See the fabric requirements in the gallery above for yardage. A serger/ overlocker is optional but NOT required. Support – Please join the Rebecca Page Sewing group should you require any assistance at any point throughout your RP sewing experience. This wonderful community of sewistas is friendly, knowledgeable, and always willing to help! 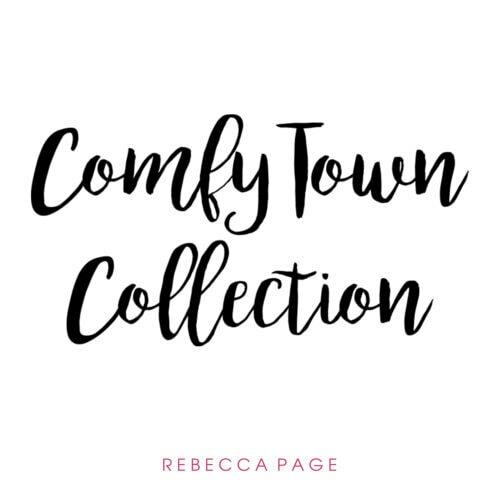 It’s also just a happy place to be, where you can share photos of your RP sews, enter giveaways, get sales information, and new-release updates. This dress was awesome to sew. The instructions were clear and the cutting out of the pattern and fabric took longer than sewing it together. Nor hemming as a design element was absolutely fantastic! My new dress fits beautifully, the tea length hem, and the 3/4 sleeves are very flattering and I have had lots of compliments on my dress. I made the short frill but will definitely be making the longer frill and the 3/4. Such a great pattern! I LOVE THIS PATTERN. It’s a quick sew and so many options. I want to wear the dress I made every single day. The twist in front made me a bit worried at first, but when i had my pieces infront of me with the tutorial it was easy. The second dress is really fast sewing. With the long frill it feels like a Princess dress (för adults😂). It had been more than 5 years since I last sew something new. It was great starting with this wonderful pattern. At first, I got a bit scared of the front bodice with the frill, but once I understood the first step, it was quite a quick sew. 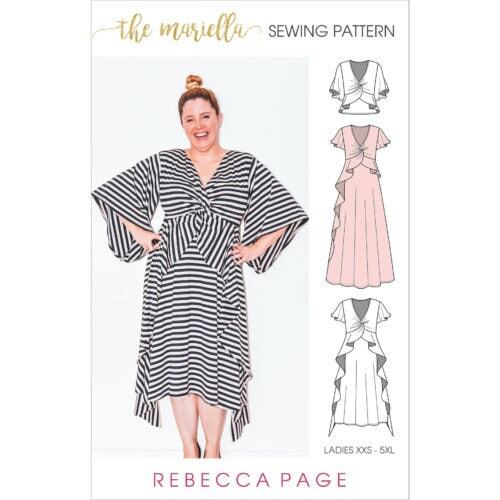 The Mariella is a very flattering dress with a lot of options; she’s a BREEZE to sew once you get the knot done and that part is explained to perfection in the tutorial! Please don’t let the sleeves fool you into thinking this is a warm weather dress; mine is getting lots of winter-wear with turtleneck tees and leggings plus boots underneath! I’m already searching my stash for fabric for my top version. 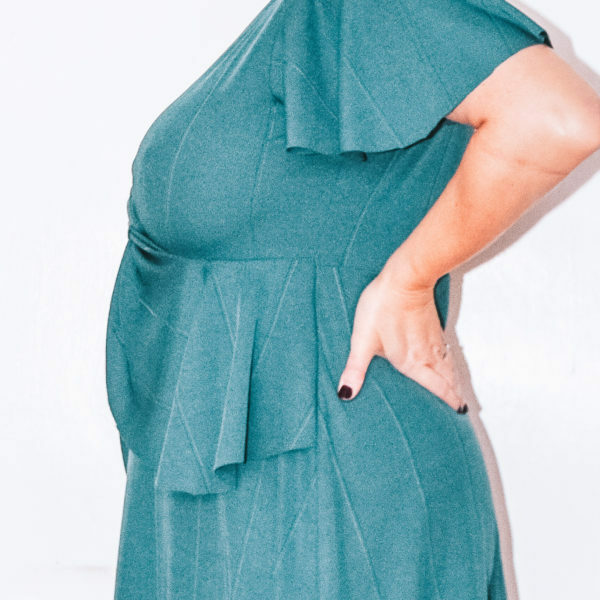 I love having dresses that are comfortable but flirty and Mariella fits that to a T. Hubby even gave me the ever-elusive “oh wow!” when I tried it on, I did an asymmetrical version and he loved how the ruffles cascade but are “attached” to the dress. 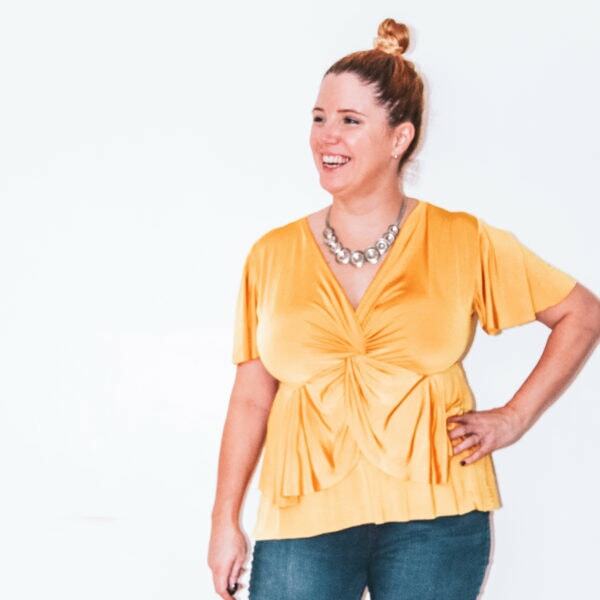 Definitely need several more in my closet – this is a staple! The Mariella Dress is a beautiful dress that helps to hide some trouble spots you might have, while making you feel beautiful and feminine. The dress was an easy sew. Be sure to read the pattern fully before beginning to understand how the knot comes together. Love this dress! What a fun pattern! I’ve got a bit of a tummy and I was worried the frills might draw attention to that, but they drape very nicely and are very flattering. 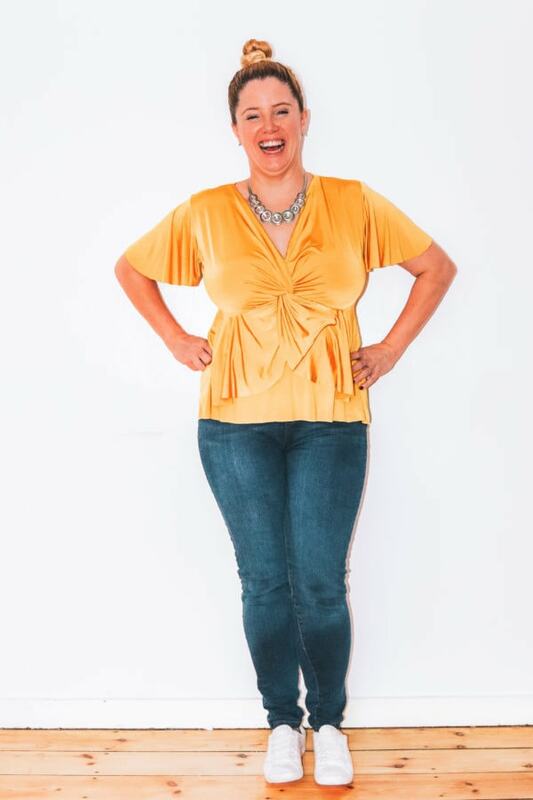 The different frill options and different length options make for a nice variety of different tops and dresses you can make. I tried it both in double brushed poly and a heavy modal spandex, and both were great for this dress. It’s a fast and easy sew, too – the most difficult part is creating the twist and the clear instructions made it simple. Beautiful dress and top! Many options and looks great in solid or pattern or mix and match. For a looser fit, follow the size guide, but if you want it body hugging, I recommend sizing down. Really like the dresses I made with this pattern, absolutely love the tops ! This was my first pattern in over a year and it was so easy to figure out. I’ve never done a print at home pattern but the directions were easy to follow I will be getting more. This dress was so cute and comfortable when finished. Overall, the pattern came together well. Once I saw how the the crossover went together it was easy! I love all of the options to create multiple different looks. I can’t wait to try a top next! The Mariella comes together very quickly and creates a flattering dress or top. The frills make a lovely drape and the knot front, while not difficult, looks complicated and makes the top fit very well. It is not often I can find a bodice that fits my chest well without being too revealing. This v-shaped neckline is gorgeous and I do not have to worry about being exposed. I would consider this a fairly easy pattern to put together as the directions are clear and the number of pieces is not overwhelming. I can see this being a staple dress that can be worn both casually and for more dressy occasions. It is versatile and can be made with a variety of knit types to achieve different drape effects. Looking forward to whipping some more versions up as soon as possible! This dress is perfection! 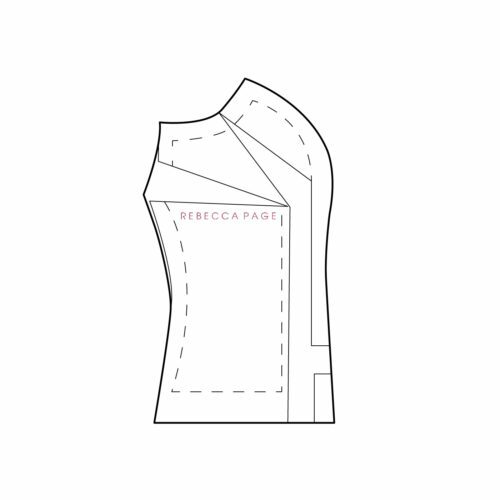 As a beginner sewista, I was really intimidated by the knot in the bodice but it was so simple and overall such a quick and easy sew. I love all the options, too, and definitely see a lot more of Mariella in my future. 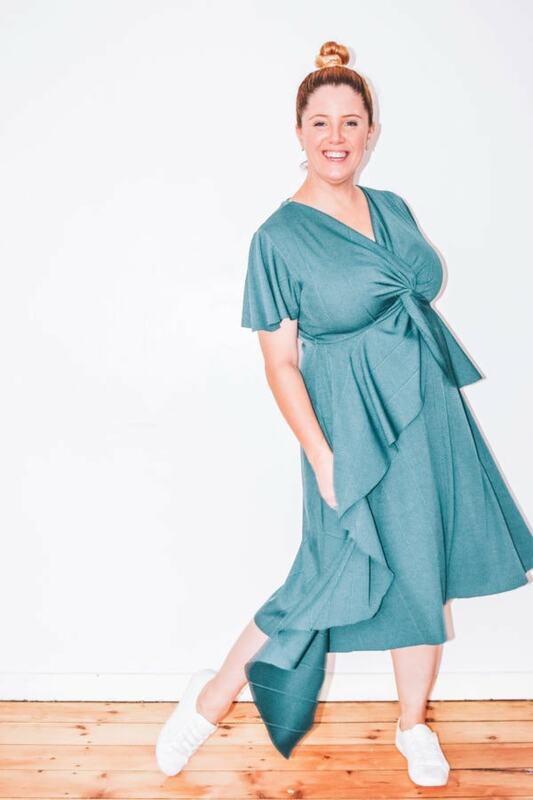 The Mariella dress is very flattering, and is also a fun sew if you are looking for something a little different. This dress was really fun to sew. Once I understood it the dress took less than an hour from cutting to finished product. It is a flattering fit and is very versatile. It would work well as a more formal dress or a laid back dress depending on the fabric used. I would highly recommend it to others looking to make a lovely dress for any occasion. Great quick pattern! Perfect for all the super soft knits you have in your stash! This is such a neat pattern! I love the bodice knot and frill details. I learned some new techniques with this bodice and really enjoyed making it and then the end product is just stunning! I made the tea length dress to start out with, but I’m looking forward to making a couple tops and more dresses! You will be thrilled with this pattern and all the different options it has! This pattern was so much fun to make! It was a piece of cake after the knot was figured out. Such a pretty, feminine pattern! I really love the effect of the soft frills and it’s super quick if you opt out of hemming! 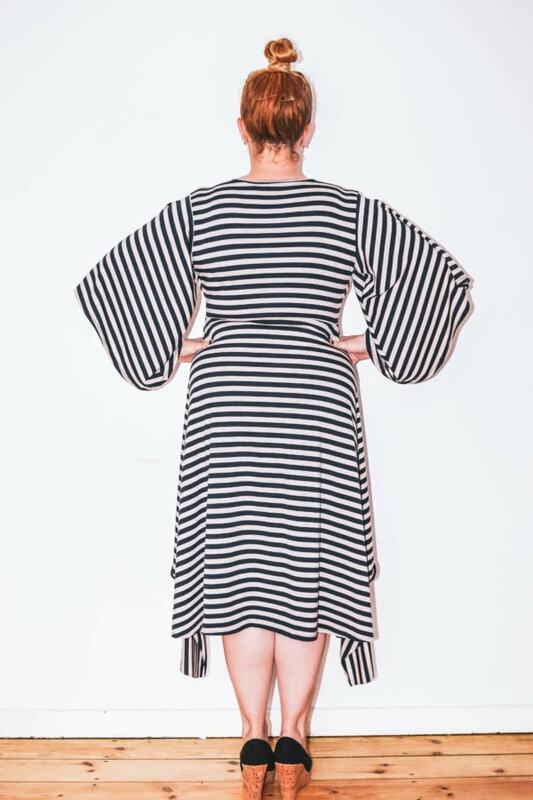 This is a great pattern and such a flattering sew. like that it has detailed easy instructions as well as a quick reference for those more familiar with such a pattern. I’ll definitely be following up my dress with a few tops. 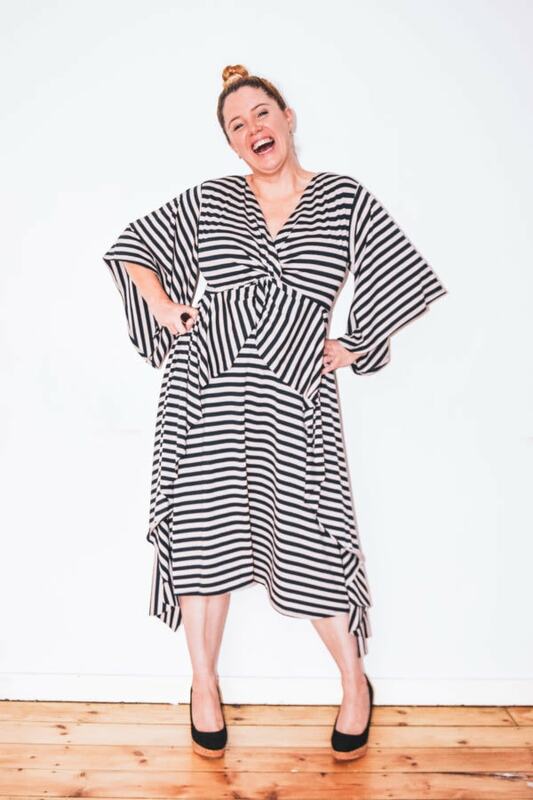 Mariella is such a sophisticated and fun pattern! I love that it can be dressed up for formal wear or down for everyday wear. All of the pieces go together beautifully. While this pattern took some time for me, the instructions were very clear and turned something that at first seemed a little intimidating into something fun and easy! It is a very quick sew and result is fabulous. I recommend it to everyone to try. Love this dress/top. It will become a staple in my nursing wardrobe. Knot was a bit tricky at first, but once you get it the rest goes together quickly. I love how unique this dress is! 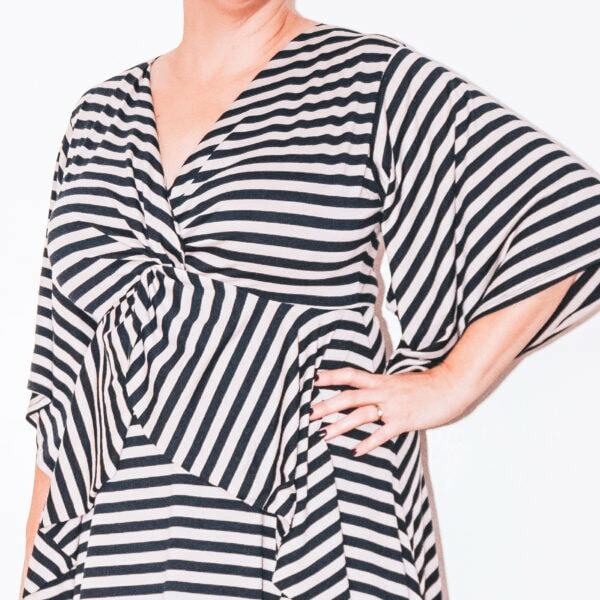 With the right fabric, this would be a super easy sew, because you don’t need to hem! It’s also great that it has 3 different lengths. Oh and it’s awesome for nursing! I really enjoyed creating this dress. There are several elements of the pattern design that I found totally unique and very clever. I learned about a couple of techniques I was unfamiliar with, and the dress was still a quick sew – once you become familiar with the pattern they come together very quickly and easily! The outcome is beautiful – a unique dress that fits very well and will draw many compliments. The pattern allows for a lot of creative license on the sewist’s part as well – with several options for colorblocking and mixing fabrics, as well as multiple choices for sleeves, length, and design elements. Overall a very solid pattern for a really nice garment. I absolutely love this pattern. No need to make any adjustment in the bodice. Love the different lengths too. Will be making a top soon.Thank you for a wonderful pattern. Tag your photos with #rpmarielladress on Instagram.